Glow sticks became popular in the 1980s. 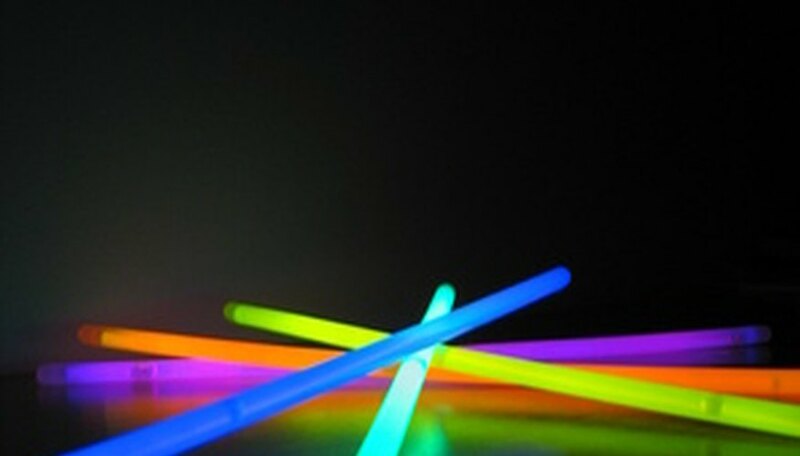 While most glow sticks are made from similar components, better quality glow sticks will last longer than the cheap ones available at dollar stores. Glow sticks are popular at Halloween and parties as they are inexpensive, safe and fun to use. A glow stick gets its light from a process called chemiluminescence, meaning light is given off during a chemical reaction without any flame or heat involved. The process is similar to how a firefly lights up. Scientists worked to duplicate the firefly light and in the 1970s the first glow stick was based on chemical work by Edwin Chandross at Bell Labs. At the same time, the U.S. Navy was also inventing a glow-stick-type device and received one of the first patents in 1973. Inventors kept working on the device and, in 1974, Herbert Richter and Ruth Tedrick received a patent for their chemiluminescent light device. Glow sticks are waterproof, require no batteries, and are disposable and inexpensive. The military uses glow sticks as they are considered a cold light, one that doesn’t produce heat. Glow sticks are common in emergency kits for a quick light source. They are also used during camping and other recreational activities where there is no electricity. Outdoor events and concerts allow glow sticks since they are safe and do not produce a flame or heat. A glow stick contains two nontoxic chemicals. One is encased in a thin glass tube with the other encased in the plastic tube of the glow stick. Upon bending the glow stick slightly, you will hear a crack, which is the glass tube breaking and releasing the chemical. The reaction when the two chemicals mix lights the glow stick. There are two types of glow sticks. A high-intensity, low-duration glow stick gives off a bright glow that only lasts for approximately five minutes. A low-intensity, high-duration glow stick gives a lower level of light that will last up to 24 hours in some cases. The chemical reaction occurs at a lower temperature, making it able to hold the glow longer. This is the type of glow stick that is sold for recreational use. While the chemicals in a glow stick are nontoxic, care must be taken if a glow stick breaks or ruptured as the byproduct phenol is produced when the chemicals react. Phenol is corrosive and poisonous and can cause irritation and vomiting in some people. Wash all areas of the body that come in contact with the chemical and keep all chemicals out of the eyes and mouth. How to Make Ballistics Gel Like the "Mythbusters"
What Kind of Paint Should I Use in Blacklight?